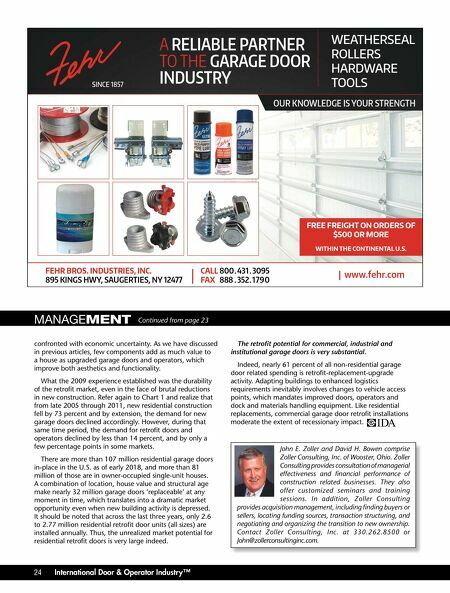 A RELIABLE PARTNER TO THE GARAGE DOOR INDUSTRY WEATHERSEAL ROLLERS HARDWARE TOOLS OUR KNOWLEDGE IS YOUR STRENGTH www.fehr.com FEHR BROS. INDUSTRIES, INC. 895 KINGS HWY, SAUGERTIES, NY 12477 CALL 800 . 431 . 3095 FAX 888 . 352. 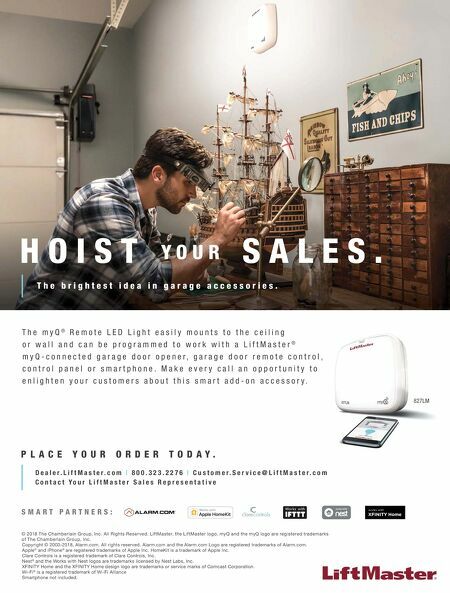 1 790 SINCE 1857 FREE FREIGHT ON ORDERS OF $500 OR MORE WITHIN THE CONTINENTAL U.S. 24 International Door & Operator Industry™ MANAGEMENT Continued from page 23 confronted with economic uncertainty. As we have discussed in previous articles, few components add as much value to a house as upgraded garage doors and operators, which improve both aesthetics and functionality. What the 2009 experience established was the durability of the retrofit market, even in the face of brutal reductions in new construction. Refer again to Chart 1 and realize that from late 2005 through 2011, new residential construction fell by 73 percent and by extension, the demand for new garage doors declined accordingly. However, during that same time period, the demand for retrofit doors and operators declined by less than 14 percent, and by only a few percentage points in some markets. There are more than 107 million residential garage doors in-place in the U.S. as of early 2018, and more than 81 million of those are in owner-occupied single-unit houses. A combination of location, house value and structural age make nearly 32 million garage doors 'replaceable' at any moment in time, which translates into a dramatic market opportunity even when new building activity is depressed. It should be noted that across the last three years, only 2.6 to 2.77 million residential retrofit door units (all sizes) are installed annually. Thus, the unrealized market potential for residential retrofit doors is very large indeed. The retrofit potential for commercial, industrial and institutional garage doors is very substantial. Indeed, nearly 61 percent of all non-residential garage door related spending is retrofit-replacement-upgrade activity. Adapting buildings to enhanced logistics requirements inevitably involves changes to vehicle access points, which mandates improved doors, operators and dock and materials handling equipment. Like residential replacements, commercial garage door retrofit installations moderate the extent of recessionary impact. John E. Zoller and David H. Bowen comprise Zoller Consulting, Inc. of Wooster, Ohio. Zoller Consulting provides consultation of managerial effectiveness and financial performance of construction related businesses. They also offer customized seminars and training sessions. In addition, Zoller Consulting provides acquisition management, including finding buyers or sellers, locating funding sources, transaction structuring, and negotiating and organizing the transition to new ownership. Contact Zoller Consulting, Inc. at 330.262.8500 or John@zollerconsultinginc.com.